What conditions might lead to the best footprints? Recent experiments show that the best footprints aren’t made in fresh, new mud. Instead, the presence of a coating on top of older mud leads to the best tracks. Fresh mud tends to be sticky and flows readily. Footprints made in this type of mud are poorly preserved and leave few little details. Fresh, sticky mud adheres to the feet, leaving at best a partial impression in the ground; as the foot is lifted, some of the surrounding mud flows into the footprint. Footprints made in this type of mud seem to be typical of most of the known dinosaur tracks, which is why they are so hard to associate with particular species. On the other hand, older coated mud seems to be a much better medium for making and preserving finely detailed footprints. This type of mud is commonly found around ponds and is sometimes covered with a greenish coating of algae and bacteria. Experiments have shown that the coating acts as a binding agent. It keeps the muddy surface together and prevents flow into the footprint after the foot is lifted. It also acts as a parting agent, preventing the mud from sticking to the feet and resulting in deep prints with fine details. A third benefit to the coating is that it slows down the drying of the mud, allowing the prints to be formed. Tracks made in this coated mud can be deep, very clear, and well-preserved, with plenty of anatomical detail. The most well-known dinosaur footprints were probably made under these conditions. 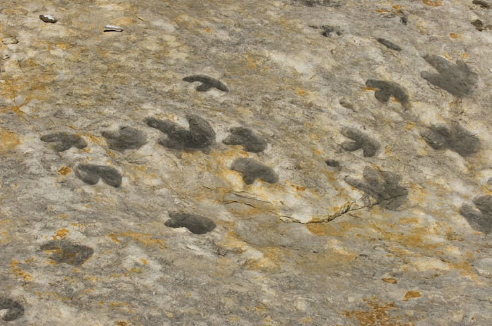 Under the right conditions, even the footprints of dinosaurs may be preserved for eons. Such finds can tell paleontologists a great deal about the anatomy and behavior of dinosaurs (iStock).